We’d love your help. Let us know what’s wrong with this preview of Prague by Vladimír Soukup. The 'Eyewitness Travel Guides' feature vivid descriptions, fine illustrations, street finder maps, and three-dimensional cutaway illustrations of historic buildings, as well as the practical information about where to stay, eat and shop. 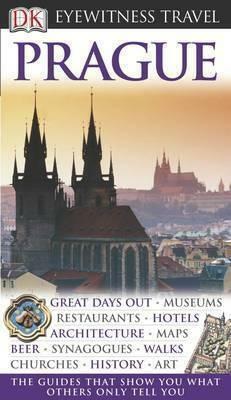 To ask other readers questions about Prague, please sign up. And I was right! There is a great historical section at the beginning of this book with lots of pictures and timelines that are great reference - plus, as you read about different buildings or areas, they provide the original historical page numbers so you can go back and remind yourself about what you learned and place it in historical context. I really loved learning about this ancient city. I feel like I have a sense of the basic conflicts and resolutions as well as the actual geography of the space - the different districts and major landmarks. The graphics in this guide book are quite good and there MANY colorful maps and diagrams. My only complaint (why it gets 4 stars instead of 5) is that sometimes things felt a bit out of order. In general, there would be a map of a district, say New Town, and on that map are lots of numbers that correspond to different paragraphs about that specific place. Almost always, it would go map then paragraphs (so you could go back and forth to reference). And then a couple times, there would be additional numbers that weren't on that initial map and so I'd search all around and find that number on a later map and that was annoying. Consistency would've been better - or a notation to see map on pg. # whatever. Of course, at the end there are practical sections for people who are actually going to travel there, which seem to be very thorough and up-to-date, but probably I would always look online first before traveling to make sure things haven't changed. I did skim through most of that stuff but there appears to be lots of suggestions for hotels/restaurants, etc. I don't actually know if they skipped anything important but it was really full of information and for places of larger significance (the most popular cathedrals/art galleries/palaces) they would get their own two page spreads with suggested walking routes and particular things to look out for. Very good information. Can't wait to go in October. Really great for history, background, and for walks. We loved seeing places in foot and reading about them as we went. J'aime les guides qui donnent du contexte historique. Cependant, après le voyage, j'ai trouvé que les suggestions offertes étaient des offres banales que j'ai ignoré. This was really useful and the maps were excellent for our holiday. Decent travel guide. I am not the biggest fan of travel guides as I feel you can get a lot more information and up to date advice online. I only read travel books if I borrow them from the library.